Juliana is passionate about cooking and dreams of making her mark in gastronomy. When she discovers the Gourmet Chef Challenge: Around the World competition, she sees an opportunity to show her skills and goes on the TV show! Make your creativity work and learn how to prepare tasty recipes to win the Gourmet Chef Challenge: Around the World competitions. Travel through various countries to search for ingredients and cooking materials that will help make you a brilliant chef. Enjoy the change of scenery as you discover various local specialties, from Europe to the United States, Brazil, India, Russia, Morocco, Canada, China, and Japan. Help Juliana confront her fierce competitor Kyle, and win the big Gourmet Chef Challenge: Around the World competition! Interactive inventory and 35+ levels! 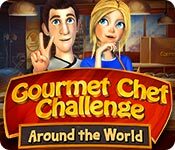 Gourmet Chef Challenge: Around the World is rated 2.3 out of 5 by 40. Rated 5 out of 5 by Karavan from Different puzzle and HOG, loved it I don't understand the low star reviews because I loved this game. I cook a lot and my son is a Chef so it was right up my alley. I loved thinking about the dishes and the ingredients that went into each. I read cookbooks to relax! I think it helped that I knew all the ingredients and what they look like. I was not intimidated by the timer because you could repeat to get the best score and I found it fun to remember where things were to speed up on multiple chances. It was actually relaxing for me because you can repeat as much as you want. I am charmed by the locales and dishes. I like HOGs and puzzles as well as time management games. This is not really time management just timed. I play a lot of games so this was different and I enjoyed that. Maybe not for the time management buff but a fun game that I found just the thing to wind down with. Rated 5 out of 5 by sbechirian from Food challenge! I dont know why but this game make me think of all the reality shows you see in television (Kitchen Nightmares, Hells Kitchen). Plus, I would qualify this game having the most futuristics graphics: well design, beautiful colors.... A Windows 8 kind of game for those who like the "new" games brought into this world!! 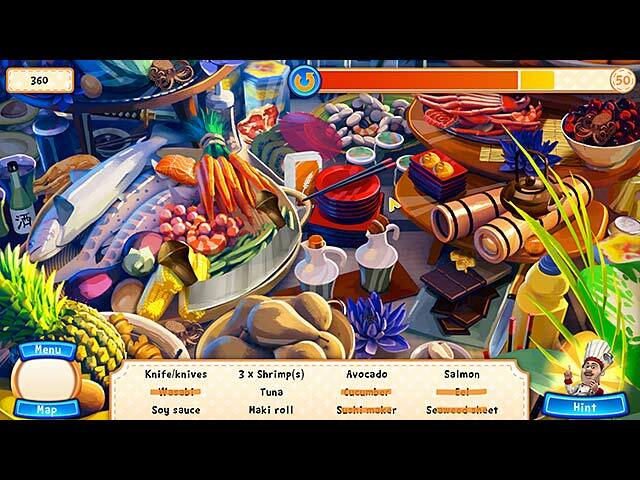 Rated 4 out of 5 by AnLuk from Nice little cooking game. It's pretty for easy for good players, but it's excellent for ok players or beginners. My kid brother is 7, and he loves it. My Grandpa loves it too. They play together sometimes in the seek and find games, they have a lot of fun. My brother has a whole new food vocabulary he didn't have before, and now wants to be a cook when he grows up. Rated 4 out of 5 by dazedwombat from Maybe not time management but different I normally don't like hidden objects games but this gave me variety which I have been craving for. I like the puzzles games something different at last. Rated 4 out of 5 by twinsoniclab from I had fun playing, and that's a good enough reason to play a game! I don't usually review on this page, but wanted to counteract the poor reviews this game does not deserve! It's a cute little game! Fun. Not a TM, which may account for the low reviews, since people expected it to be. You visit a location on the map, to prepare a regional recipe. First a HOS where you find the ingredients, then a puzzle to prepare it. The puzzles differ by location. Nothing strenuous, but fun. The graphics are lovely! I had no problems identifying any needed objects. It's the kind of game you can play when you don't want to get into a deep story. You can play one location within a short time, and stop for a while. Not challenging in the least, but I still like it! Rated 4 out of 5 by agedbeauty from Time Management?? This is not a time management game! On every level I have played so far (most of the trial) it starts with a hidden object screen. After you have found all the ingredients you go to a puzzle game. Some quite inventive but often very simple games. If you want time management then this is not for you, if you like puzzles and hidden object then ok this might amuse you for a while. I personally found it didn't keep my interest for long and the time given for getting a good bonus was only achievable if you replayed so you knew where the objects were. Disappointing as I prefer time management. 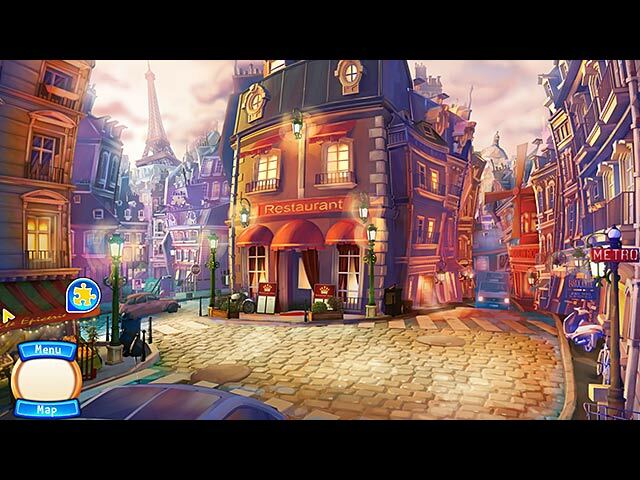 Rated 4 out of 5 by pennmom36 from Gourmet Chef Challenge Flipping burgers at the local diner isn't what Juliana had in mind when she went to cooking school, so naturally she entered the Gourmet Chef Challenge featuring Chef Morris This is a cute game, with nothing but hidden object scenes followed by a brief mini game. You will start out at the diner making hamburgers, first you find the ingredients needed in a list HOS, which is timed, the quicker you find items the higher the score. After finding the ingredients you will prepare the burgers on a grill and you must flip the burgers at the right time, if they are undercooked or overcooked points are deducted and if they are just right you get 10 points. You need to make pancakes to enter the contest and again you find the ingredients in a HOS and prepare the pancakes with a mini game where you flip all pancakes over but when you click on some pancakes others turn as well. Now you are officially in the World contest competing for the title with Kyle a very smug cook who thinks he deserves to win. 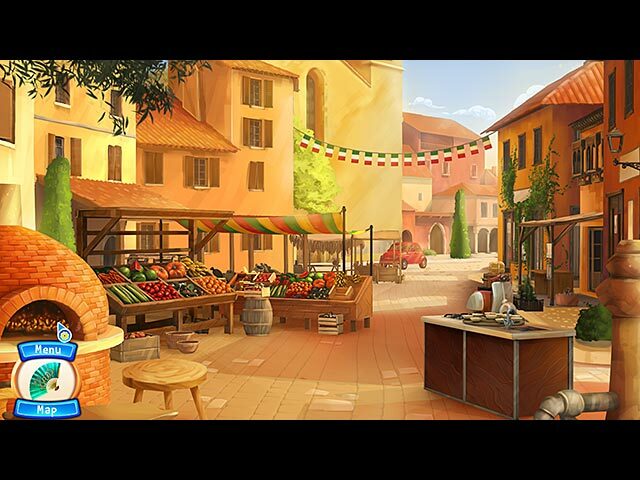 You will complete dishes in the United states, Italy, France, Canada, India, and China such as pasta with pesto in Italy and Ratatouille in France. There are two separate trials in each country and the goal is to achieve 3 stars, you can replay the mini games as well as the HOS as often as you want to try and get a better score. If you like culinary arts, (personally I like culinary eating better) or just like simple games to relax with then you will like this game, if you need a game with more of a challenge then you might want to pass on this one. Start cooking around the world and enjoy! Rated 3 out of 5 by SkippyTrini from Gourmet Chef Challenge: Around the World This game made me a little confused if didn't quite give clear direction. You had to look in the forums for help. When i finished it said i could continure playing to get three stars there wasn't really away for me to do so. I love Big Fish but this game wasn't up to Big Fish standards sorry! I didn't think i would be confused that much! Rated 3 out of 5 by jackfaithsmom from Interesting game blend, but not for me. Let me start by saying this was not a time management game at all, at least not by traditional standards. It does have a blend of HOG, puzzle games, and mini-games, but the games are fair at best. I got annoyed and turned it off when I had the correct answer to a puzzle but it continued to score me at 0. The tutorial was all but non-existent. Not a buy for me. Compete in a famous TV show and become a renowned chef! Help Juliana win the big Gourmet Chef Challenge: Around the World competition.